Ok, maybe today WordPress and my internet connection will let me upload some pictures. Keep your fingers crossed. Yeah it worked and I can finally share some progress pictures with you. 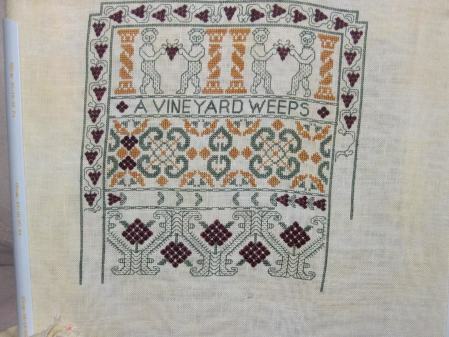 First, I spent some time stitching rhodes and over one grapes on Bordeaux. To keep myself from either getting too frustrated with the over one grapes or completely ignoring them at all, I am committing to doing at least one length of them each time I stitch. I would really like to get to part 4 by the end of this month. Sorry I can only put up a thumbnail. When I try to do a full size image, it only shows a tiny corner of the picture. Strange. Later in the week, I worked very hard on Barnabee’s Quest. I finishe part 2 and got about half way through part 3. I won’t be working on it this weekend as we are going away, but hopefully the next time I pull it out, I will finish it. I will be adding some Round Robin stitching in its place for a while. Speaking of Round Robins, my Seasonal Dragon is almost ready to be mailed on to Outi in Finland. 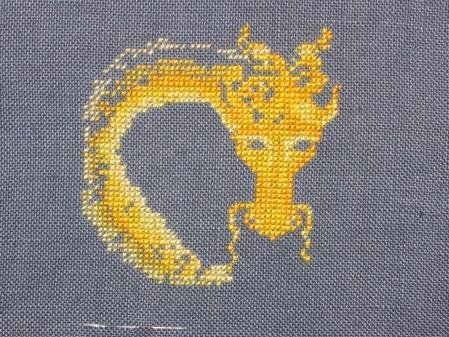 All that is left is to monkey with some blending filament and do the backstitch. There will be a lot of open areas on this dragon for a while as we will be waiting until the RR returns home to add the beads. And last but not least this week, I actually made some progress on Potager du Roi. I almost finished three of the pools on the side of the piece. I hope to have all four, plus the staircases on top of them done this month. Should be an attainable goal. Well, now on to some fun for the remainder of the day. This is spring break for our school district. I went to work yesterday, but I decided to take today and tomorrow off in addition to the freebie vacation days we get at the end of the week. I have some chores and stitching planned for the next two days and then we are spending the four day weekend making the rounds of Allen’s family. BTW Cooper is trying to help me write my post and says PURRRRR! Purr to Cooper too 🙂 Lovely progress! Hi Cooper! Tell your mommy to give you a good scratch around the ears for me, okay? You’ve done great stitching again this week, Leslie. You are really steaming along on Barnabee’s Quest and it’s nice to see your Spring Dragon nearly ready to send. I still have 12 days to get mine to that point. Right now, it only has a handful of light yellow stitches. 🙂 Enjoy your time off this week! 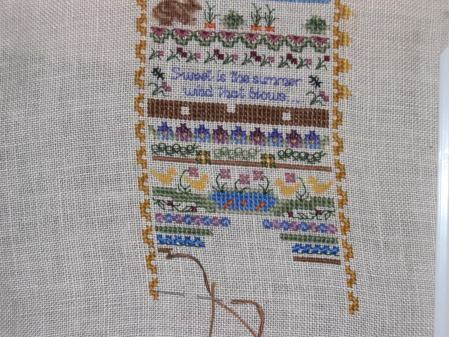 Wow, lots of lovely stitching this week! Well that is some serious stitching there 🙂 Great job all around and beautiful to boot! 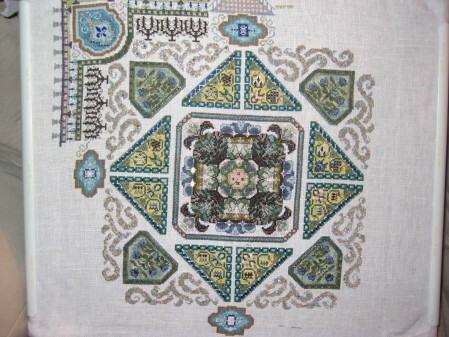 Have a nice vacation and some serious stitching time! Fantastic progress on all projects! All your WIPs are looking stunning Leslie!! Just beautiful. Felix sends a warm purr. Wow- you have been busy!! Everything looks great!! I love the dragon, very cool. Your stitching looks awesome. Ann. You have so many gorgeous WIPs on the go! They look great!! Wow, lovely WIPs. These Mandala Gardens are such huge projects but so beautiful. Beautiful progress on all your WIPs, you are just blazing along! PRRRRR to you too Cooper!! (I know I’m not original). Your WIPs are so pretty Leslie. Good luck with your grapes.